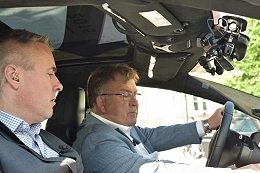 TV2 Denmark uses DPA microphone for in-car news interviews. Denmark, January 2016: Denmark's main commercial television station TV2 is using d:screet™ 4080 Cardioid Lavalier Microphones to live transmit a series of highly unusual live political interviews for its 24-hour news channel. The interviews are all conducted inside a Tesla electric sports car, which was first deployed by TV2 during the country's recent election campaign. This highly innovative and usual mobile studio is entirely unmanned by TV2's technical staff and is operated remotely from the broadcaster's studios in Copenhagen.